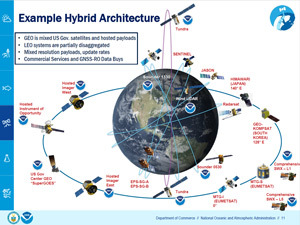 The NOAA Satellite Observing System Architecture (NSOSA) study looks at the choices, alternatives, and tradeoffs that NOAA is considering as it plans for its future operational satellite observing system to follow the current fleet of NOAA satellites. On June 21, 2018, NOAA hosted a Community Day in Silver Spring, Maryland, to address questions and hear comments about the draft report. The day included a public event followed by a series of one-on-one meetings. On May 31, 2018, NOAA released a draft of the NOAA Satellite Observing System Architecture Study for public comments. The comment period closed July 2.